Few people can claim to have experienced a life quite as professionally and culturally diverse as Richard Morais. Although Morais is a dual American-Canadian citizen, he was born in Portugal and spent his life until the age of sixteen in Zurich, Switzerland. Only then did he return to his homeland to attend the Sarah Lawrence College on the outskirts of New York. It was here that Morais began his professional career as a news intern, before joining the Forbes team in 1986. Three years after joining Forbe’s he convinced them to send him to London, where he lived for seventeen years becoming Forbes’ longest serving foreign correspondent. Whilst on this wonderfully varied journey, Morais happened to establish a firm friendship with the late Ismail Merchant, the founder of Merchant Ivory Films. Morais remembers Ismail as a larger than life character with a deep passion for food, who, even when he was your friend, was always working out how you could be of value to his many adventures and exploits. Morais recalls, for example, a perfect example of how Ismail’s intuition always ensured as much gain from a situation as possible. One evening whilst dining at the Bombay Brasserie (London), following a viewing of In Custody which Merchant directed, Morais put it to Merchant that he should create a film that marries his love of the kitchen with his love of film making. Morais hoped to find a literary product that could be adapted in to a film, a novel where food was not just a strand of the plot, but so much a fundamental aspect of the novel that the food and the story are impossible to tear apart. When no story could be found Morais decided to write it himself. The result was Morais’s suitably food driven debut novel The Hundred-Foot Journey, a feast of a book that provides the reader with charm, wit, and a thought provoking story of life’s lessons. 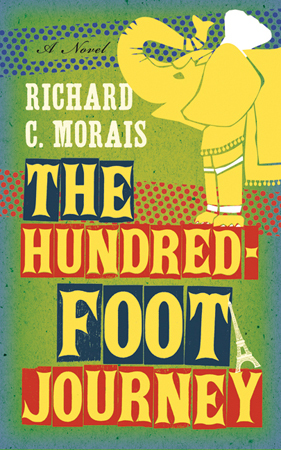 The Hundred-Foot Journey by Richard C Morais, published by Alma Books, is out now.